What Is an FPBF File? A file with the FPBF file extension is a Mac OS X Burn Folder file used in in the Mac operating system. It's used to store shortcuts or references to the files and folders that you want to be burned to a disc. In macOS, the folder that has the .FPBF extension appended to it is labeled as just Burn Folder, but you might see it elsewhere referred to as a Finder Backup Burnable Archive file. FPBF files can be opened with Apple's Finder. Some FPBF files might also open with Adobe Photoshop. If this works for you, then all Photoshop is doing is opening a Photoshop-compatible file, like an image, that's stored within the FPBF file - you can't use Photoshop to burn the files to a disc like the Burn Folder is intended for. 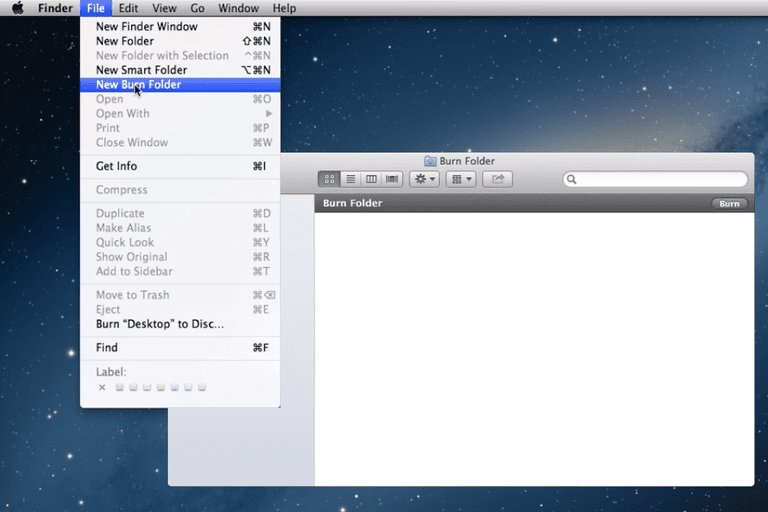 To burn files to a disc on a Mac operating system, you can either use Finder's File > New Burn Folder menu option or just right-click the desktop and select New Burn Folder. Either way, a new folder with the .FPBF extension will be created. macOS may even create the FPBF file automatically when a blank disc is inserted. You won't see these options if your computer isn't connected to an optical disc drive that can burn discs. At this point, you can drag and drop files and folders into the FPBF file that you want to have burned to the disc. Please understand that doing this does not actually move or copy the files into the FPBF file. Instead, a shortcut to the original files are all that's being created. Because a reference to the original file is all that's stored in the FPBF file, you can update the original data on your hard drive as many times as you want before you actually burn them, without having to re-associate them with the disc by dragging them into the Burn Folder again. This also means you can delete the FPBF file without worrying that the files it refers to will be removed, too (read this if your FPBF file is locked and won't delete). While the files you drag into a Burn Folder are just aliases to the actual files, you need to make the distinction between files and folders as well as between your Burn Folder and your hard drive's actual folders. For example, if you drag a folder that's full of files into the Burn Folder, and then open said folder from within the Burn Folder, what you're actually seeing inside at this point is the data that exists on the hard drive (since the folder is a simple shortcut), which means if you remove a file from that folder, it will be deleted from the folder on the hard drive as well. When you're ready to burn the files and folders that the FPBF file is referencing, you can either right-click the Burn Folder and choose the Burn "<folder name>" to Disc... option or double-click the folder to open it and then choose the Burn button located at the top of the window. There aren't any file converters that can convert an FPBF file to a different format. The format is used for the specific purpose of gathering data that you want to burn to a disc; having this file in any other format would be useless. To be clear, the FPBF file is not an "image" file like other disc image files, so converting it to ISO or IMG or something like just doesn't make sense, technically. What's a DAA File and How Do You Open One? What's an SFV File and How Do You Open One? What's a CDR File and How Do You Open One? What's a GHO File and How Do You Open One? What's a JOBOPTIONS File and How Do You Open One? What's a KYS File and How Do You Open One? What's a DIRECTORY File and How Do You Open One? What's a DICOM File and How Do You Open One? What's an STA File and How Do You Open One?